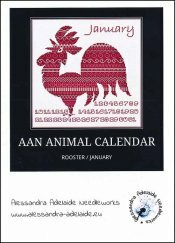 AAN Animal Calendar: January Rooster [W6185] - $13.44 : Yarn Tree, Your wholesale source for cross stitch supplies. Cross stitch pattern by Alessandra Adelaide Needleworks. The first month of this calendar, January, features a Rooster! The Rooster is stitched in hues of red & white. Below the Rooster are numbers. Stitch count 150w x 150h.